I don’t really know if the squirrel treed the coyote, or if the coyote treed the squirrel, but they both ended up high off the ground in a large pine tree, with the squirrel, as usual, showing itself to be the craftier of the two. The coyote climbed down without a prize, and I got some more shots of a coyote in a tree. Sirens sounded, and then I could hear the familiar sounds of coyotes “howling”. The howling always includes high pitched squeals along with some barking. I ran to where the sounds were coming from, but did not arrive in time to catch the “howls” on my recording device. The howls segued into a “barking” session, probably prompted on by the appearance of a hostile walker and dog approaching in the distance. I’m including this recording of the “barking” section to show the slight difference in male and female coyote voices. The female has a “ra-ra-ra-ra” type of bark and a very high pitched, continuous tremolo. Her voice fills most of the recording, with the male’s interspersed. The male has a deeper bark — more like a barking dog’s. The grunts are his. His tremolos are always short, as if he can’t quite keep them going — there are only a few of them: at 17 seconds, 101, 222 and I think 227. See bottom of page: Male and Female Coyotes Barking. Are Mother And Son Becoming A Pair? I have been watching the development of a coyote family for several years now. Twenty-one-month-old male sibling pups have led an idyllic existence in an urban park. The hunting of gophers and voles has been good, most dogs are kept away from them, people who see them are thrilled to do so. These siblings have progressed from mutually playful and mutually adoring best-friends, through sibling rivalry which ultimately has created a divide between them. The rivalry has established who is higher on the hierarchy and who is subservient. I’ve been told that each of these fellows “chose” his position. There was never an all-out battle to see who would be tops, rather the positions have more to do with force of personality and strength of will. The subservient fellow, although still in the vicinity, spends more and more of his time alone now. He has always been the fun-loving one who started most of the play sessions that I witnessed. But over time, beginning this fall, his solicitations to play were answered with more and more bullying and dominance by his sibling, until now there are no more such solicitations. When the dominant sibling approaches, this more subservient fellow is apt to run off or bravely look away and then run off. Now, I often see the mom and the dominant sibling together — and I get a different feeling about them than previously, almost as if they have become a “pair.” For one thing, the male has a fullness which I had not noticed before, which may be contributing to why I sense this. Of course, maybe this isn’t going on at all. However, I’ve been impressed with this possibility for several weeks now and I want to keep it in mind as a likelihood. We’ll have to see. These interactions lasted about nine minutes. It was not light enough to see anything but the outline of one coyote when I arrived at the scene. I sat down to watch. 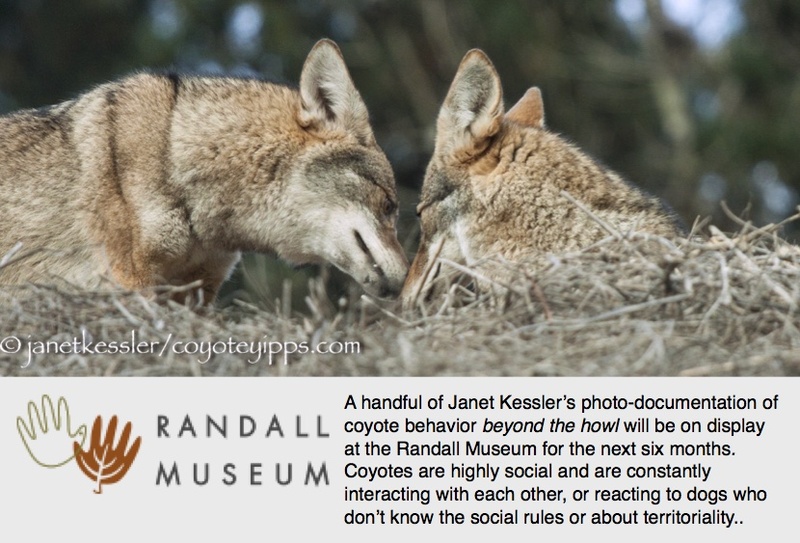 Soon I became aware of two more coyotes — the mother and subservient sibling, resting only a few feet away from the first fella — the dominant sibling. I’ve put captions on the photos rather than explain it here below. This family interaction took place a while back — at the beginning of November. The family consists of a single mom and her two 21-month-old male offspring who have recently established a strong hierarchy between themselves. The dominant sibling is the one doing all the approaching on this day: he approaches his sibling to dominate him, and he approaches his mom to increase his bond with her at the expense of his brother. Of special interest here is that after Mom watches Dominant Sibling hover over and dominate his more subservient sibling, she then makes sure to let this dominating fellow know that she is above him. She does this first by taking his snout in hers and then by raising herself above him with her paws on his back. He allows her to do this: he is below her in the hierarchy, but above his brother. Displays of dominance include a dominant muzzle enclosed over the more subservient muzzle, standing over and higher than the other fellow, holding the tail up high often with hackles up, approaching. Signs of submissiveness I’ve seen include cowering with ears down or back, head held lower and moving in a slinking fashion, displaying vulnerable parts and letting the dominant guy bite your inner thighs, hitting the ground on your back showing the belly, fleeing. One of these two young coyotes found an abandoned dog’s ball and picked it up to play with it. Bullying brother came over and knocked the coyote over for the sole purpose of showing him who was boss, and then hovered over him menacingly. When the bully became momentarily distracted, the more subservient coyote was able to run off. This kind of behavior happens regularly these days and serves as a constant reminder and confirmation of a ranking status which has to become accepted by both coyotes. These photos were taken at the beginning of November when there were still attempts by the more subservient coyote to interact with his sibling. After a dog group had gone by, this coyote approached the trail a little bit and tried assessing the group by smell — never actually stepping on the path itself. I don’t know what kinds of smells the coyote was searching for, but smelling is a primary information gathering mechanism for them — could it be the equivalent of several sentences worth for us? ?